If you are at a sushi bar and the guy slicing the fish is the also the guy from which the restaurant is named, you are all but guaranteed exceptionally great sushi. In this category, there's Ikko, Hamamori, and Shibucho -- just to name a few in Orange County where the chef responsible for your meal also signs the rent check. But when you talk about the majority of sushi joints out there, this isn't the case. 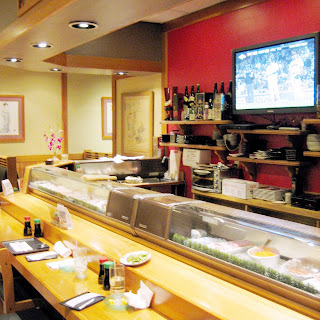 Most restaurants merely employ their itamae, who might be there one day, gone the next. As such, if you wait too long between visits, you might discover that the journeyman sushi chef whose creations you admired has left, leaving you to settle for the dreck made by the guy who replaced him. Irvine's sushi bars are particularly susceptible to this game of itamae musical chairs. So when my friend and fellow O.C. food blogger Chubbypanda invited me to eat at Gen Kai, I was hesitant. This was, after all, a place I had already tried about a decade ago whose sushi left me unmoved. But I agreed because Gen Kai had nowhere to go but up. And if there was a different chef holding court now, that meant a completely new dining experience -- perhaps a good one. And I'm happy to say, it was. The master currently behind the counter is an itamae named Juuji, who's held the post for the past two years. We did him the honor of ordering "omakase", which is the equivalent of bowing reverentially, and saying "I trust you to serve me what you will". If he seemed initially caught off guard by our request (the restaurant was nearly empty that night), he was also delighted. He quickly sprang to action, putting forth one of the best and cheapest (more on the price later) omakase meals I've had lately. It started with vinegary half-moons of cucumber and a palate-cleansing salad of squid and octopus. The squid harbored bites of sinus-clearing ginger cut into matchsticks and crunchy, julienned sea kelp. The octopus was in ribbons tinged orange from spiced vinegar -- the candy-sweet yin to the spicy yang of the squid. 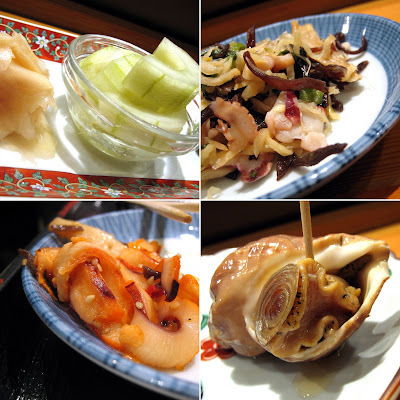 Then he served a whole poached sea snail, impaled on a toothpick, which were to be used to coax the meat from the shell. The fleshy innards slid out with a tug, looking like the flexed bicep of a juiced-up body-builder -- lumpy, shiny, and resilient to my bite. While I was still contemplating the complexities of the sea slug, our chef dispatched a live spot prawn, twisting apart its body into two halves. The tail he disrobed and deveined, posing it spread eagle on top of grated radish. The head he presented as a centerpiece on the plate. Its antennae were still writhing wildly in the last throes of death. Flavored with the life force that coursed through it just seconds before, the sweet shrimp lived up to its name. But so did the others on the plate with it. Orange clam, which were the size of guitar picks, actually trumped the shrimp on sweetness. Flanking it were scraps of aji in a tataki dressed with scallions and grated ginger. The fish, which is naturally salty, was also slicked with the oil that naturally oozed from its pores. Next to that were wedges of cherry-red chu-toro; frictionless and cooly soothing cuts of tuna. Braised skate wing, chilled with its jellied broth, felt like a dense hybrid of chicken breast and canned tuna. I flaked the meat off its central bone using my chopsticks like a surgeon meticulously trying to extract a tumor. Then came a delicate roll wrapped in soy paper, containing shrimp, salmon, asparagus and avocado, cut into teardrop cross-sections, served on a plate dotted with Sriracha and spicy mayo. This was followed by ankimo, the liver of what is possibly the most grotesque species to swim the ocean; the monkfish. But with this delicacy that many consider the foie gras of the sea, fishdom's Quasimodo more than makes up for its hideous appearance. Its liver is similar to a very dense custard if it were made entirely of egg yolk. Like foie gras, one bite is more than enough before you overload on the richness. And one was all that I needed from the five pieces our chef provided. In the meantime, our shrimp heads were whisked away to the kitchen, where it was lightly battered, and plunged into hot oil. Now fried, it was dangerously spiky, rigid, and completely serene-looking. I ate the whole thing -- beady eyes, fatty guts, skinny legs and all -- but very carefully, orienting its barbed face away from me. Even still, one errant appendage almost managed to pierce my inner lip. A good gnashing between my jaws pulverized the rest. A simple stack of pickled napa cabbage calmed my mouth after the savage battle with the shrimp head. 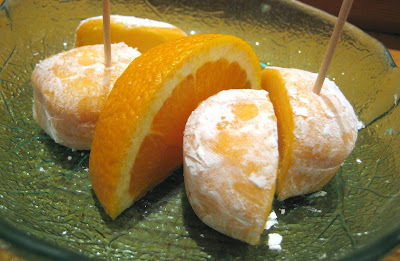 Then, there was a squishy, mayo-sluiced, tobiko-topped, deep-fried nori roll that sat on slices of lemon. In a zen-master stroke typical of his style of speaking, Juuji called it "pizza". Water-seared hamachi steaks sluiced in ponzu and shaved onion was the last thing he served before dessert. The perk and pep of the topping highlighted the meaty milkiness of the cuts. As he closed our meal with some mango mochi ice cream, our itamae apologized that he wasn't able to offer us more cooked dishes. But for this terrific omakase meal that cost only $40 (tax and tip excluded), it was me who should be apologizing. How could I have not visited sooner? My only hope is that he sticks around a while. At least until he opens his own place called Juuji's. Been there a few times, a good friend took me there-- and have never been disappointed. They usually have fish that you don't normally find in Irvine-- or even elsewhere-- and their prices are always reasonable. Mmmm - I haven't had good Sazae in a while, grest post Elmo! Crazy to read that name again Gen Kai -I used to go there in the late 80s for lunch occasionally when I worked in that area. Jeffery & Walnut, correct? hmmm I hadn't heard too many good things about gen kai, but now I'm intrigued. all for $40 too? dang. it seems we are often on the same page... or sumthin. I'm doing omakase for my birthday in two weeks, and I chose sushi murasaki in santa ana. never been but heard it's fabulous. That was some good eating. I was surprised, too. Gen Kai hadn't come up on my sushi-dar in years. 40 bucks for the amount of food you got is a great deal. I've always been flummoxed in trying to find a good balance of price and a full tummy when it comes to omakase. You're right about that! They had *just* run out of needlefish when we were there. OK. I Google'd "sazae" and I still haven't found out what it is. And to think I ate it! Please enlighten this non-Japanese! Close. It's on Jeffrey and Irvine Center. Right across from IVC! I also was less than impressed when I ate here sometime in 2001. My, how things have changed. Thanks to Juuji! I heard good things about Murasaki too. Can't wait to hear about what you think of it. But if you do try Gen Kai someday, be sure to tell Juuji that you want the $40 omakase. Or just name your price and he'll feed you accordingly. $40 was enough to get me and Chubbs very, very full. Thanks again for letting me join you! Like I said in my e-mail when you first proposed it; if you say it's good, it will be. I can honestly say that this is the fullest my stomach has ever gotten after omakase. Pretty amazing, especially since Chubbs and I actually shared the hamachi at the end and also the squid-and-octopus salad at the beginning. YUP! And filling! I've paid $75 for omakase and I've never been as full as I was at Gen Kai. If you try it, be sure to get a verbal confirmation of the price. Or just ask Juuji you want the $40 omakase that your friends told you they had! Hi Elmo - Sazae is the turban shell sea snail. When it's fresh, and without all the gritty bits, it is wonderful. "I see!" said the blind man! gruesome and bloody advertisement on the right hand side. It made me loose my appetite! I was wondering when somebody was going to say something about that advert. I debated approving the ad. Horror movies and food just don't mix. But then I counted how many more meals I can pay for and then blog about from the modest amount they were going to pay me! Food bloggin' ain't a cheap hobby! Any little bit helps. And I'm not about to ask donations from my readers! But you're right: It grosses me out too. But please bear with it for 7 more days. The ad expires next Friday. And thanks again for the kind words about my little blog! With a restaurant that empty, I can't imagine there would be turnover high enough for the fish to be very fresh. It's hard to imagine, but it's true! The stuff I had that night was very fresh! I don't know, man... Despite this positive review, I'm still pretty skeptical about this joint. Unless I'm missing something, I still don't see how a place can afford to continuously restock fresh fish if it doesn't have the customer base that is paying and eating that fresh fish instead of letting that fish go to waste. What day did you go there? Maybe that accounted for the empty restaurant in a otherwise normally busy restaurant, or maybe that was the day they got a new shipment in? Other than avoiding Mondays, are there any guidelines about the best day to go a sushi place? Or, maybe, this place is a tax shelter for the Yakuza?! We went on a Thursday night and everything we had was fresh. Chubbypanda's first trip (made before this visit) was also stellar. As with all of the stuff I write, I can only speak to what occurred on one particular instance -- the slice of time I was actually there. Usually, you can extrapolate this experience to all other times...but as with everything else in the world, things change, quality either goes up or goes down. But if anything was off or subpar during this meal, I wouldn't have hesitated to warn people about it. And if there was absolutely nothing redeeming about the restaurant, I wouldn't have even bothered writing about it. Also, I'd be afraid to write about it, especially if the yakuza were involved! At $40, the omakase appears to be a tremendous value. Actually, it wouldn't seem too out of place at twice the price! But how would you place Gen Kai in the OC sushi hierarchy? 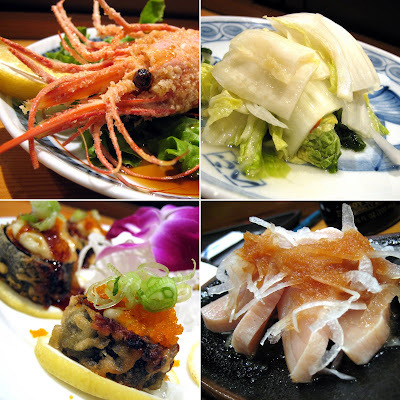 How does it stack up to the likes of Shibucho, Bluefin, Hamamori, et al? My current fav is Sushi Wasabi in Tustin. On value, I'd rate Gen Kai number one right now. But overall, for omakase, Sushi Shibucho is still my favorite. What kind I say, I'm loyal. Bluefin and Hamamori are in a league of their own and a price point of their own. I consider them the birthday sushi places. And I haven't tried Sushi Wasabi. I heard it's $100 per person! Thanks for the reply. For Sushi Wasabi, the omakase has been in the $80 range in my experience, but I can easily imagine how it could break the three figures! 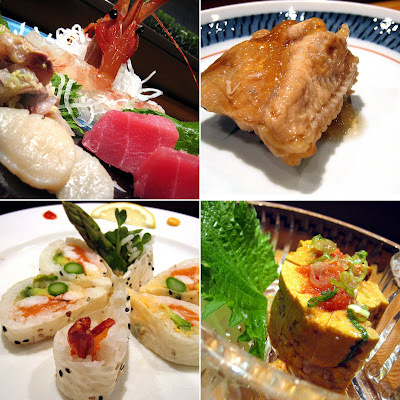 If you haven't seen my report: http://www.kevineats.com/2007/02/sushi-wasabi-tustin-ca.htm. Definitely worth a try in my opinion. Went there on May 22, 2008. First of all, this is not a Japanese restaurant although they serve Japanese food if you see the distinction. You'd think anyone opening a Japanese restaurant would know that it's more than the food - it's also the experience including the ambiance, great service, and cleanliness for goodness sake. This place looked like a pizza joint, the service was terrible, nobody spoke a word of Japanese, and the rude sushi chefs had no concept of omakase (which was the only reason we went there after reading Elmomonster's review). We raced out of there and eventually found ourselves down at Maizuru on Alton Parkway which although run by non-Japanese folks, they get it and have really made the effort to be a Japanese restaurant. They even learned how to make some pretty good sushi rice which is usually a tell-tale sign.